A Zeeland woman has discovered the secret of retaining the vitality of youth, even well into your 90s: immerse yourself in the joy of children. Gertrude Van Haitsma will celebrate her 95th birthday on Thursday, March 9, still actively engaged in her teaching career. 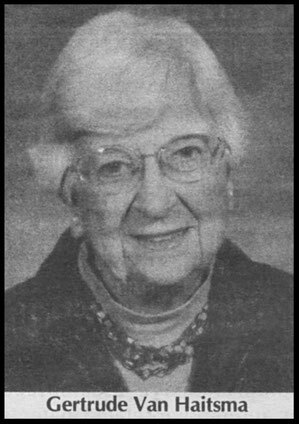 A 1943 Calvin College graduate and daughter of a pastor secured her first classroom assignment at Zeeland Christian School, where she stayed for three years before moving on to instruct students in Rehoboth, NM, for 13 years. A major life change came in 1959 when Van Haitsma went overseas to Nigeria, serving as a teacher to missionaries' children. She called Africa her home until 1974. Her educational career came full circle when she returned to Zeeland Christian School in 1995. She continues in her role of providing academic support to elementary students, working three mornings per week in the job she loves. "I am most thankful for having the privilege of influencing young lives," said Gertrude. The member of Bethal Christian Reformed Church of Zeeland also is grateful for the One who has led her along the many paths of her long life. She concluded with a gentle smile, "We praise God for His many blessings and faithfulness." Gertrude Van Haitsma has been part of our docent team for over 20 years educating visitors about local history. She was born in Michigan's Upper Peninsula, but moved frequently about the state due to her father's profession as a pastor. Her young school years were spent in Cutlerville and Portland, then high school in Lake Odessa. She earned her teaching degree at Calvin College and began teaching in Zeeland Christian schools. After three years, she joined the Christian Reformed Mission and ventured to New Mexico to work with the Navahos. After more than a decade there, she was off to follow her passion for teaching in Nicaragua for an additional 15 years. In 1974 she returned to Zeeland to care for her aging parents until their deaths. While retaining ownership of the family home on Division St., she returned once again to W. Africa. Her final move back home to Zeeland was in 2006. Gertrude never married to have children of her own, but throughout her most exciting and interesting life she positively influenced the lives of untold numbers of youngsters. She may be retired, but that hasn't stopped her yet. She still shares her compassion and teaching skills in the Zeeland Christian system working with special needs children. She said she has entertained the thought of retiring again soon, but that is yet to be seen. Addendum. Gertrude is still active at the Zeeland Museum working as a volunteer and docent. Thank you, Gertrude, for over 25 years of dedicated work with the Zeeland Historical Society!